These Items are reproduced with the kind permission, of the Vice-Chairman of The Pionus Breeders Association. Pionus parrots are small to medium sized, slightly stocky birds from Central and South America. They are distinguished by large eyes with a bare eye ring, short tails, and a triangular patch of red feathers around the vent. Some are predominantly green with accents of white, plum or iridescent blue, while others are a riot of blue, violet, green, teal, bronze, even purple. There are seven species, five of which are common enough in captivity to be available as pets. Pionus are easy to keep, but, like African Grey parrots, had a reputation for developing aspergillosis infections due to unsanitary conditions encountered when large numbers of wild-caught birds were being imported. 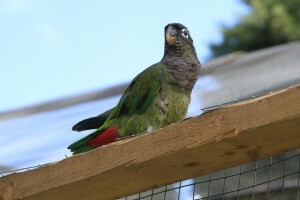 As with any other psittacine species, cleanliness of the cage or aviary is important for these birds. Pionus parrots are known to make a wheezing, panting noise when excited (for example, when receiving a really good scratch from their owners!) or when frightened. This sound may be mistaken for respiratory problems, but it is perfectly normal for Pionus. Pionus also have a characteristic, but not unpleasant odour, similar to their close relatives, the Amazon parrots. Though not known as "great talkers", Pionus have a reputation for a sweet, quiet, and gentle yet playful demeanour that, along with their beauty, makes them good pets. Common name: "Coral-bill", "Red-Billed Parrot"
Range: Northern Venezuela west to Columbia, south through Ecuador and eastern Peru south into northern Bolivia. Habitat: Tropical and subtropical forests around 2000 m elevation. 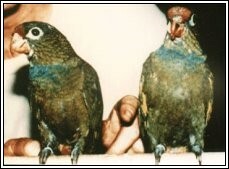 Pet Potential: Presumably, similar to other Pionus; however, since this species is not common in captivity and has proven more challenging to breed than other species, the PBA recommends that captive birds be part of breeding programs to establish a captive population, and that they not kept exclusively as pets at this time. These birds resemble the Maximilian in overall coloration, but are smaller in size, and have an attractive coral-red beak when mature. Becoming interested in the Pionus parrot is a choice you will never regret. They are gentle, quiet, and of very even disposition. Unlike numerous species of the Amazon, they do not love you today and bite you tomorrow. Pionus are personable, curious, and quite intelligent. They make wonderful pets, especially in apartments or other situations where noise can be a problem. They respond readily to voice commands as they become mature birds, if one has properly handled their upbringing. Like most birds, in a captive atmosphere, they have a tendency to become more attached to one person but still tolerate others with gentleness. Although they do not possess the talking ability of some of the Amazon or Grey parrots, insofar as their vocal pitch is more limited, many Pionus, bred and kept by a person with a high-pitched voice, will talk very well. This has occurred in all of the species I have encountered so I feel it is safe to assume this is true of all Pionus. These medium-sized parrots with short squarish tails are basically subdued shades of pastel colors consisting of the greens, blues, charcoal, white, grey, red, violet, but not in the garish tones found in the various Amazon parrots. The colour combinations of the eight species making up the genus Pionus make them some of the most beautiful of the New World parrots. The one feature common to all species is the red undertail covert feathers surrounding the vent area. If to be kept as a pet or a future breeder, it has proven advantageous to purchase domestically bred youngsters. You are more ensured of a healthy bird which has not undergone the rigors and stress of being trapped, shipped vast distances, gone through the quarantine route, etc. This also assures that the bird's behaviour is directly reflective of the person that has bred the bird, and the care they give the babies and their parents, rather than the stresses it may have may have undergone related to capture. Pionus parrots are native to Central and South America, although each of the eight species has its own habitat. They can be found from tropical coastal forests to subtropical forests at high altitudes. The Plum-crowned (P. tumultuosus), the White-headed (P. tumultuosus seniloides), and the Bronze-winged Pionus (P. chalcopterus) are classed as high-altitude birds, although the latter has been known to frequent mid-elevation and coastal forests also. The most frequently available birds are the Blue-headed (P. menstruus), the White-capped (P. senilis) and the Maximilian (P. maximiliani) Pionus, which range across Central America, to the Amazon River basin, and in the case of the Maxilimian, into Argentina. The last two species are the Dusky Pionus (P. fuscus), whose habitat is Guyana and Surinam, and the Sordid Parrot (P. sordidus), generally found on the mountain ranges of western South America. According to all records ever brought to my attention, the Sordid Pionus (nominate species) has never been identified in the parrot population of the United States. The few descriptions written in the several references describing this bird show it to be very similar to the Maximilian and insofar as several subspecies of the Maximilian are noted, it is entirely possible the bird was imported into the U.S., but not properly identified. 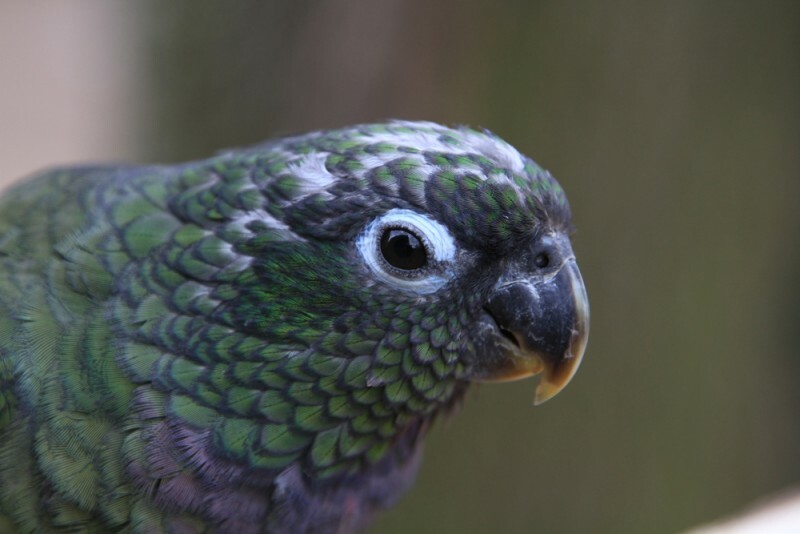 One subspecies of the Sordid parrot, called the Coral-billed Pionus (P. sordidus corallinus), is being kept in the United States. It has been successfully bred in subtropical conditions in Florida and also in the state of Wisconsin in a temperature controlled aviary. Both the Dusky and the Coral-bill are still quite rare in the U.S. and should not be kept in non-productive situations such as house pets (as of 1988 writing - note that the Dusky is now available in the pet market, though the coral-bill is still not common). Breeding this bird is relatively easy with regard to most of the species. First make sure you have a male and female. The person from whom you secure your stock may sell the birds already sexed, and should be able to guarantee this if called upon. There are several reliable methods of sexing today - surgical sexing, DNA sexing, and chromosonal analysis; make sure one of these methods has been used. Surgical sexing is still preferred by some breeders as it is quick and allows the avian vet to examine the bird's internal organs, including the gonads, for any abnormalities. On the other hand, some genetic conditions which can result in sterility may only be picked up by chromosome analysis. DNA sexing has become increasingly popular since it first became available in the early 1990's, because it is non-invasive and relatively inexpensive. A sexed pair, given the proper breeding environment, will produce three to four chicks in a clutch. Pionus generally make good parents, however, chicks may be removed from the nest at around 21 days for handfeeding. Some breeders handfeed all the chicks their pairs produce; others hand raise some, and allow the parents to rear their chicks to fledging from time to time; these chicks may not be suitable as pets, but in general may take less time to reproduce successfully, and may make better parents. The weaning time of chicks is around 12-14 weeks. One writer can only tell you how he sets up his birds. I am obliged to tell you what works for me in Dallas, Texas, as you can imagine it would not work in Michigan or North Dakota. We shall try to be logical and speak generally. First, I had a 9 ft by 16 ft concrete slab poured on the south side of my garage for the least exposure to strong, cold northerly winds in the winter. I worked for weeks on my plans and decided to work everything in 3 ft sections, as I wanted each flight to be 3 ft wide, as it matches the manufactured width of the steel wire I used. 1 inch by 1/2 inch mesh was used, it is sparrow-proof and rat-proof. I have never seen mouse traces. The flight pens are 5 in a row covered by the building of 6 ft by 16 ft. Each pair has a flight of 6 ft by 6 ft by 3 ft wide. The hallway is 3 ft wide, each pen is entered from the hallway, thus giving me 3 ft of each flight protected as an inside portion and the remaining 3 ft open to the sun and rain. In the winter months I cover the open 3 ft with lacquer-covered screen wire, making the whole aviary windproof. I install a blower-type electric heater, set the thermostat at 45 degrees, and the birds do fine, usually laying eggs anywhere from December through March. The whole building is easily hosed down and drains immediately, as a 1 inch slope was built into the foundation. The nest boxes are 10" by 10" by 20" and built from 1/2" plywood, with a removable top for cleaning. A 4 inch round hole is cut about 2 inches below the top of the box as an entry, with a 5/8 inch hole cut 2 inches below that. Doweling approximately 5 inches long should be inserted into this smaller hole to serve as a perch. On the inside, from the hole to the floor of the box, attach a wooden ladder made of doweling, the kind that can be found in any pet store. As you determine where you are going to hang the box (from the back or the side), make a 6 inch by 10 inch access door, hinged at the bottom, on the side with easiest access. Be sure the inspection door is high enough to allow for at least 6 inches coarse pine shavings, to be placed inside as nesting material. Place the nest box in the covered areas of the pen as high as you can, as there is no need to remove the top except when you take the box down for cleaning in between clutches. To hang the box, drill some holes if you wish and use nuts, bolts, and fender washers to attach it to the wire. Positioned in the 6 foot long flight, a 3 foot piece of 1 inch doweling can be used across the flight in the open area, and a similar length of 7/8 doweling in the sheltered area. Suitable natural branches, provided that they are clean and have not been sprayed with pesticides, can also be used as perches. Three or four six ounce stainless steel cup holders can be attached to the wire in the sheltered part of each flight for water, vegetables, and seed. Be sure the containers are lower than the perch, or you will find the birds roosting on the cups. Crocks for pelleted food can be placed on shelving in each flight. Shelves should be placed about 3 feet above the concrete to prevent rain from splashing into the crocks. Your Pionus, as nesting time approaches, will begin working the box. They will find pieces of shaving they don't like, take it to the entrance hole and drop it. You will notice this pile of shavings. This goes on for 10 to 14 days and you will begin to see the hen spend a lot of time in the box. Then one day, the first egg will appear. After this, don't spend too much time looking into the box. The hen will bite you, no matter how tame she was before breeding. Hens lay every other day, and chicks will also hatch every other day. 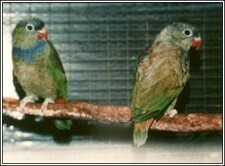 Pionus do not incubate until after the second egg is laid. The actual period of incubation is 26 days, though you will not see a hatch until 28 days after the first egg was laid. Chicks should be banded (rung) at 12 to 14 days of age. The hen, as the chicks get this old, is often out of the box, and you will have plenty of time to try the bands. If she won't get off the chicks, a small net may be used to chase her out of the box. Take the largest chick and work close to the floor. They tend to squirm, and you don't want it to get hurt if it squirms out of your hands. Banding is accomplished by sliding the two forward toes through the band (ring), and running the band over the knuckles, forcing the rear toes backward until the nails on the rear toes won't let you go any further. Take a toothpick or similar implement and for each toe, use it to turn the nail slightly to the side so that the toe comes through the band. Test the band by firmly, but gently trying to pull the band off. If the band does not come off easily, the chick has been banded successfully. If the band comes off easily, try again in another day or two. Always check in the following days that chicks which have been banded have not slipped their bands. If they do, the will have to be rebanded. If tight, bands may be forced a little using baby oil or other lubricant - the bones are very soft at this age. Banding may seem like a lot of trouble, but it must be done in order to keep proper records and to prevent possible future inbreeding of our Pionus stock. After you've banded a chick or two, you can do it in minutes. If a chick does slip a band, rather than tearing up the nest looking for it, use the next number and recover the band when you clean out the nest box. The aviary structure described provides plenty of space in which to interact with your birds. I walk in the hall and open the door to any flight, and instead of the birds flying to the far end, I find them on my shoulders. I talk to them all eye to eye, and most preen my eyelashes or ears in a display of friendliness. About 85% of my breeders are domestically bred. One season I removed three dusky chicks about 10 days old from the nest. I sat down and placed the three in my lap. I was looking them over when the hen landed on my knee, walked right up to the babies and proceeded to feed them right there. I thought to myself, where is this stress we all read so much about? I have never clipped a bird's wings under any circumstances, and all my stock are free-flyers. There are as many different ways to set up breeding quarters as there are breeders. I agree that Pionus can be raised in smaller enclosures, but never use hardware-cloth type wire in your construction. Hookbills have a tendency to chew, and could ingest minute bits of the solder with a fatal result. Provide your breeders with a piece of log in the aviary for them to chew. This also helps keep their beaks in good condition. Mineral spools, like those commonly used for rabbits, can also be mounted on wood surfaces in the aviary. Pionus lay very large eggs in relation to their body size. Sometimes a small smear of blood will be observed on a hen's first egg. This is nothing to be concerned about if the hen is otherwise fine. Something peculiar to the Pionus is the raspy, wheezing sound some birds will make when exited (the hen may make this sound when disturbed on the nest). Whether this sound is made to frighten you, or because the bird is frightened, is unknown, but it is normal for Pionus and does not indicate any respiratory problem. Pionus kept as pets also make this sound occasionally. Pionus dearly love the rain. They will turn upside down, spread their wings and flap them joyfully until soaked. If you raise your birds inside, keep a spray bottle handle and give all who respond a good misting periodically. You may have questions that may not have been covered in this brief pamphlet. More information can be obtained by joining the PBA. If your questions aren't answered in the newsletter, you can write in to make sure your specific questions are addressed.